I’ve long been a comic book fan. I know I have one about John Paul II. I’ve sold off most of them but still have a few boxes of them. Now there’s a comic book about St. Josemaria Escriva. It’s 1928. On the outskirts of Madrid a group of children are engaged in an lively exchange with a young St. JosemarÃ­a as he teaches Catechism. From there a flashback takes the reader to the saint’s childhood. 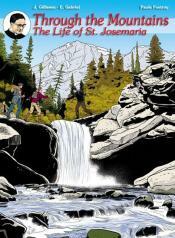 Thus opens “Through the Mountains,” the new biography of St. JosemarÃ­a EscrivÃ¡, the first one to appear in comic book format. This biography was printed in Belgium, a country known for a long tradition of high quality comic books. The text was written by Paule Fostroy, with artwork by J. Gillissen and E. Gabriel. The drawings combine simplicity of lines with vivid colors to a quasi photographic effect. The various scenes in Spanish cities and in Rome are recreated with meticulous care. You can find it at Scepter Publishers.